Pastor McKee blessing the prayer shawls. 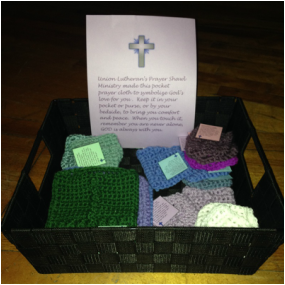 Our Prayer Shawl Ministry was created to reach out to individuals who may be going through rough times, good times, or who may need to be reminded we are praying for them. We realize that the Lord has given us talents in the form of knitting and crocheting and through the work of our hands we create prayer shawls, lap blankets, and pocket prayer cloths. We pray our creations bring our love, support, and comfort to those in need and remind them of the constant love and ever-present warmth that God provides each of us. It's a portable prayer shawl. Fits in a pocket, purse, desk drawer, etc. These are always available in baskets in the narthex (when you walk in off of Market St.) and the auditorium (on the stage). These are all pre-blessed and ready to go. If you are able to craft the shawls or the curiosity to learn how, please contact us and let us know. If you have yarn in the attic, let us know. If you remember us in your prayers, let us know! Of course! Just let us know and we can have it ready and blessed in a reasonable turnaround time, often by the next Sunday. You and/or the recipient do not need to be members of Union for we are all members of the body of Christ. Contact us now!